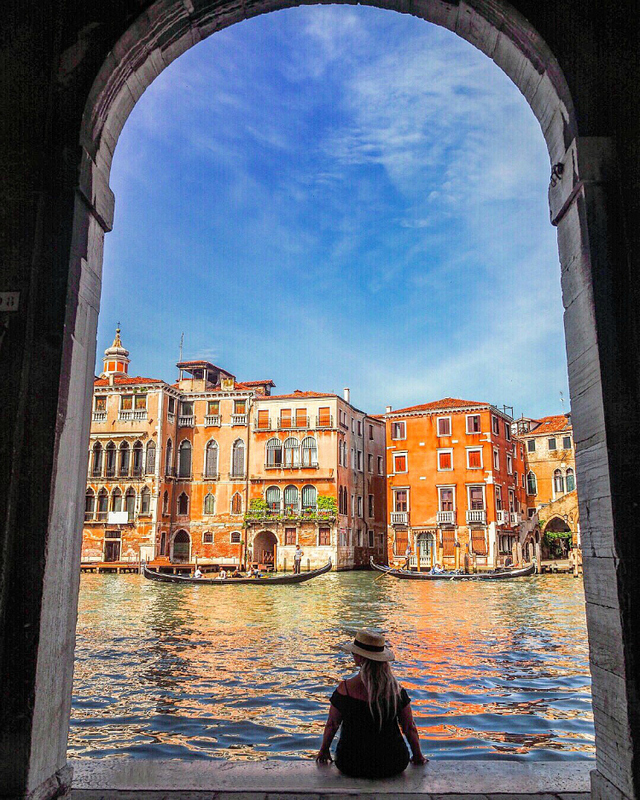 Venice gets us every time! No matter how many visits you make to this wonderful city it is always magical – there is no where else quite like it! 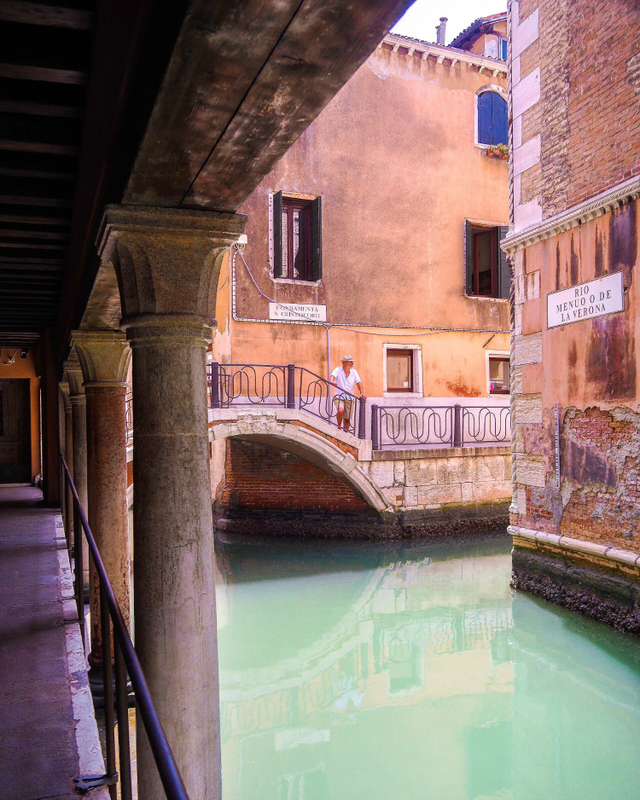 The architecture is obviously breath taking, the colour of the water totally unique to Venice, the stillness on one canal going into chaos around the corner into another canal, the tactile textures and weathered quality of everything … we just couldn’t get enough of it! 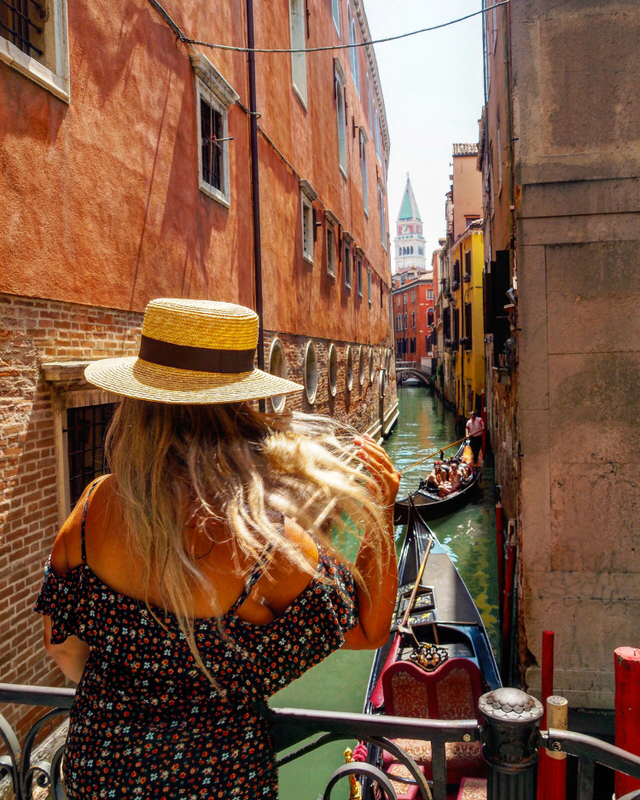 Every time we have visited we have just gone out each day and explored … it is quite compact so you will always come back around to the most tourist areas and getting lost really is the best way to see, experience and take in all that Venice has to offer! 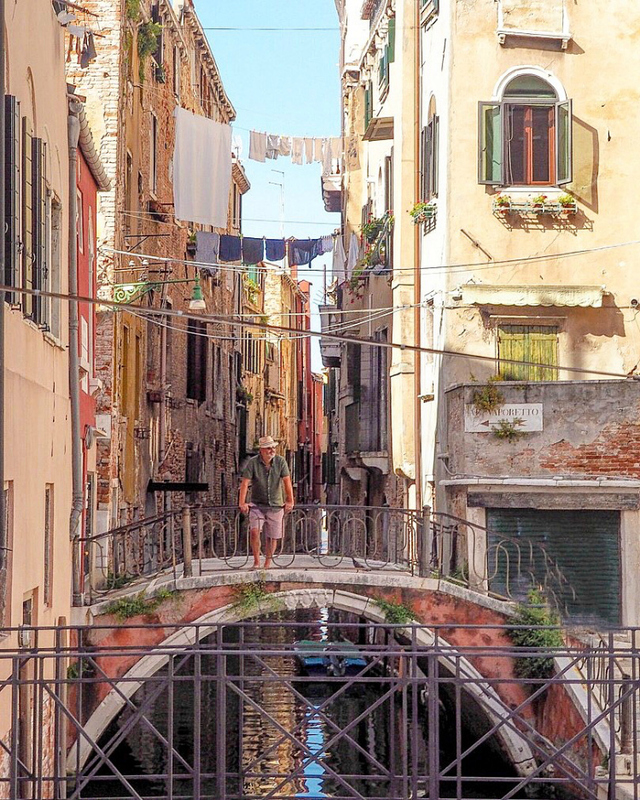 On this particular visit we did have a couple of places we definitely wanted to find and visit … the first being the wonderful bookstore Libreria Acqua Alta. It wasn’t difficult to locate but we could have easily have walked by as from the outside it doesn’t look anything special! But once inside it is a wonderful and captivating place with literally piles of books, floor to ceiling, everywhere! 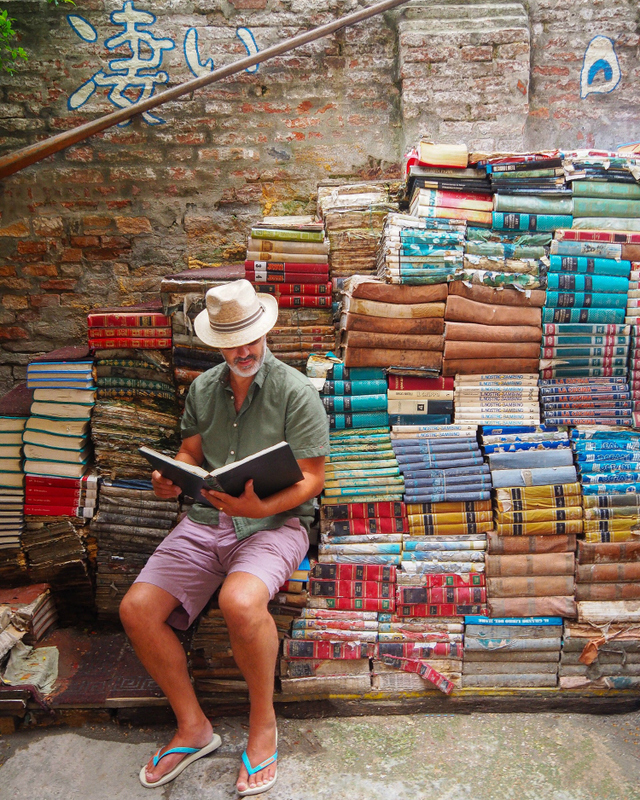 There is an old gondola sitting in the centre of the main room filled with books, there are smaller rooms to wander into that have shelves heavily ladened with books and then there is the somewhat ‘famous’ outdoor small patio with the steps made out of, yes you’ve guessed it, BOOKS! 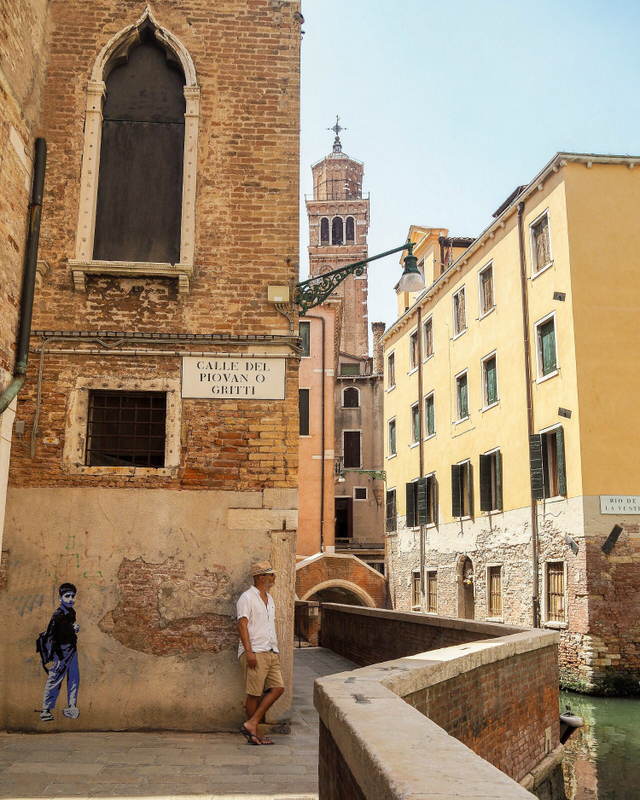 A very fun, photo op location and beautiful too as the place is so colourful and full of atmosphere – we loved it! 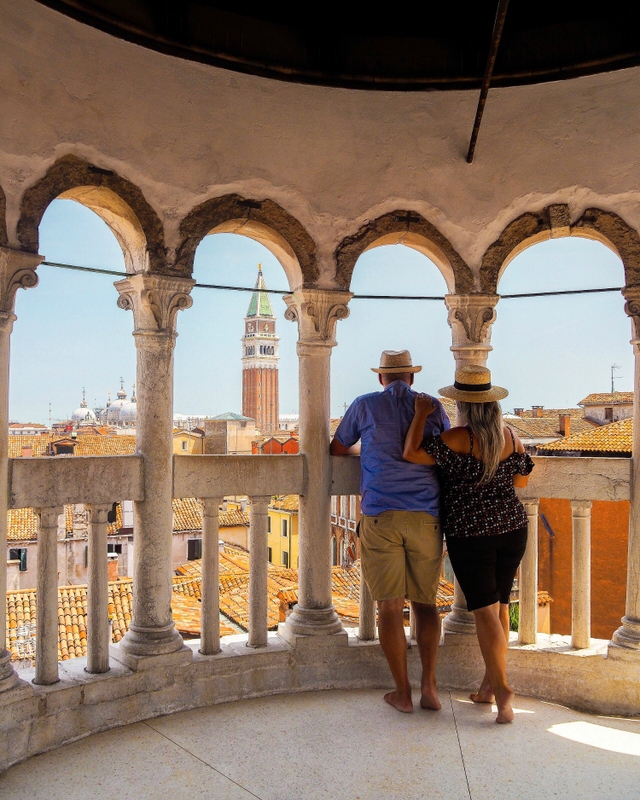 The second spot we were keen to find, see, climb and experience was the stunning Scala Contarini del Bovolo which is an external spiral staircase full of beautiful viewing arches. 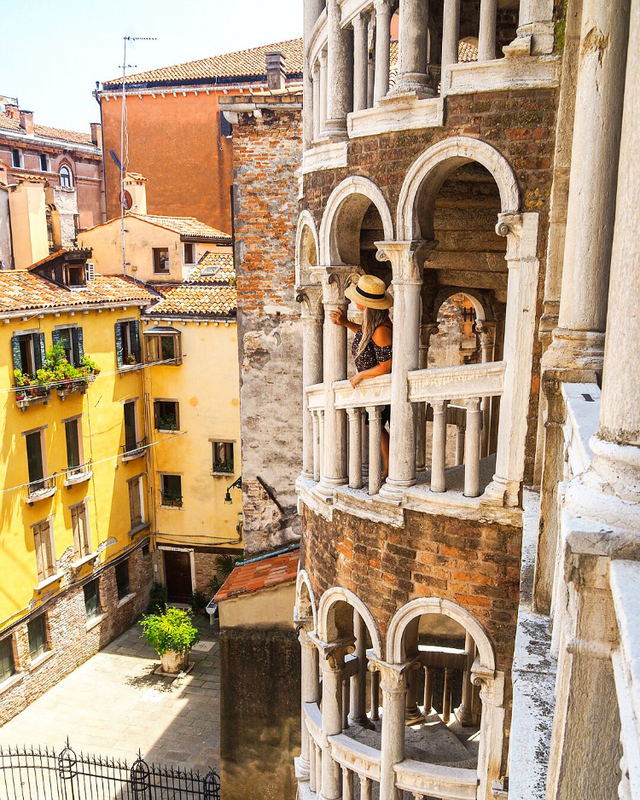 It literally took our breath away as on the approach through the narrow streets you can’t see the stairwell at all but as you step into the small courtyard where it rises tall and proud it makes for a lovely surprise! 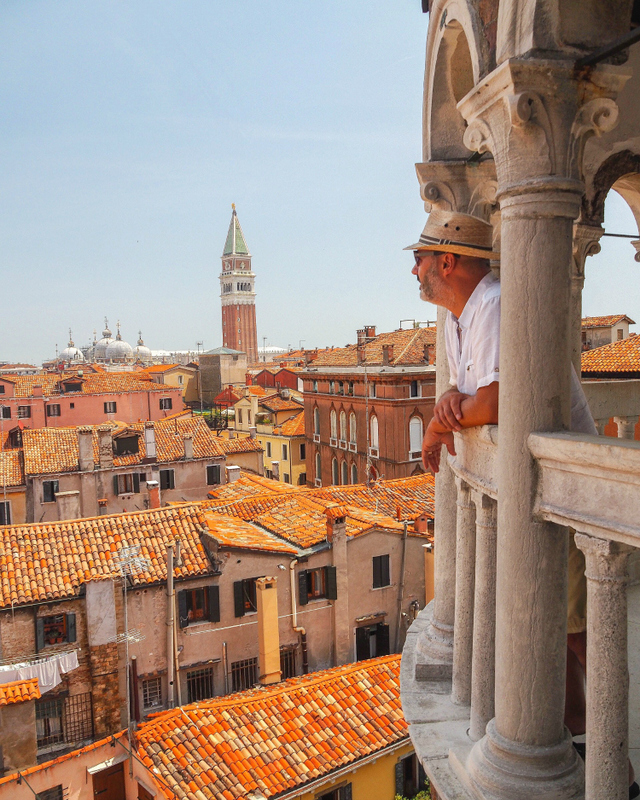 And best of all it is lesser known and hence wonderfully quiet and for a nominal fee you can climb the gloriously worn stone steps right to the top which is crowned with an almost 360 view over the rooftops of Venice through a curve of arches! 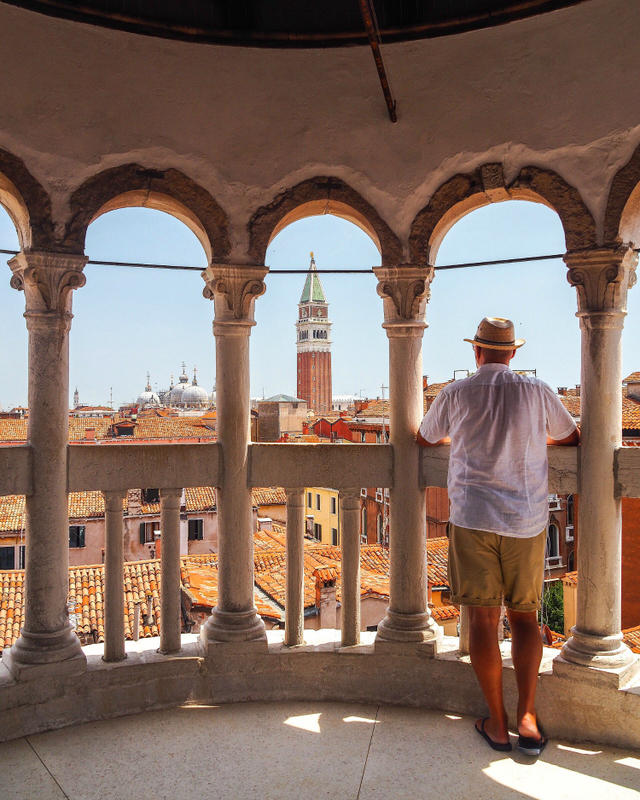 Spectacular is the word and you can see right over to the bell tower of St Mark’s square where hundreds of people are queuing to get exactly the same view! It is so hard to capture the feeling of this wonderful city but we gave it a good go and so enjoyed the colours, the details, the vibrancy and the beauty! We can’t stress enough how much fun it is to get lost here and find the quietest spots which also, in our opinion, turned out to be some of the most beautiful places we came across! And as in every city you may visit the food off of the main beaten tourist trail is always better in the backstreets … especially if there is somewhere busy with locals which can only be a good sign and indication that you will get a more authentic meal! 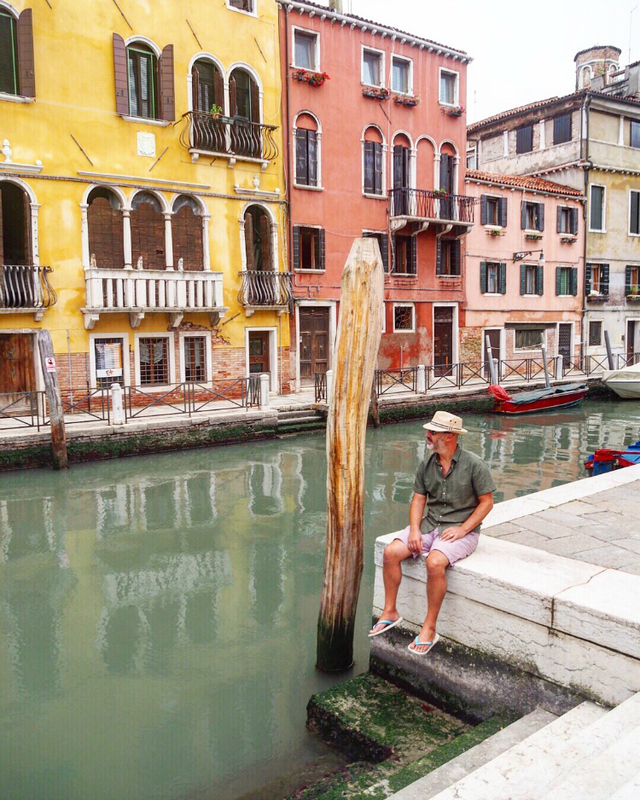 There is a real stillness and calm along the quiet canals but on the busy, wider routes because there are no cars and bikes you might expect it to be quiet but strangely it can be just as noisy! The taxi boats have horns that they are not afraid to use if a gondola or speed boat is in its way!! 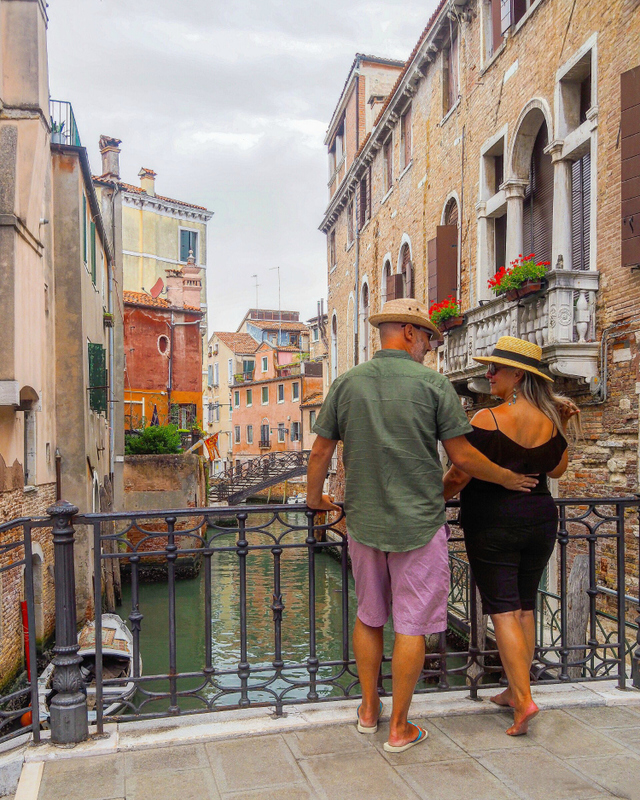 Also this is Italy so we saw many an animated and noisy exchange between disgruntled gondolas and the various boats trying to share the narrow canals – all very amusing, all very entertaining and all so very Italian! We wouldn’t want it any other way! 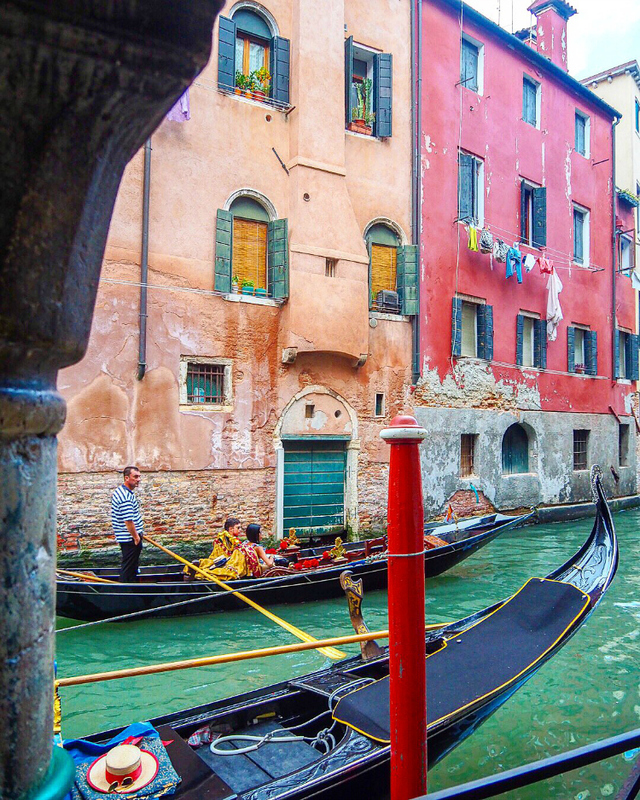 We’ve never actually taken a gondola … we get that it is or could be romantic and we know that Venice would be the place you would go on one … but to be honest it just doesn’t appeal! The general price for a couple is 80 Euros for about a half an hour jaunt. 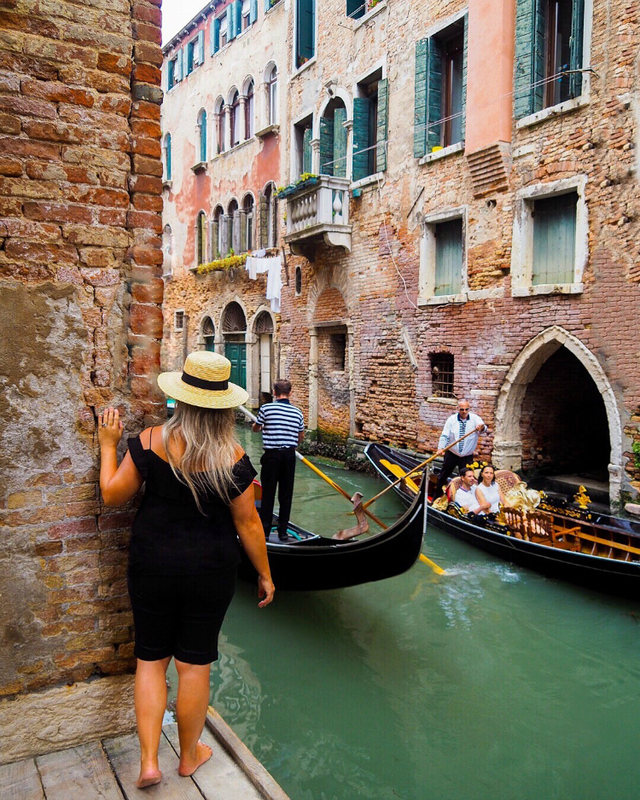 To be honest a gondola isn’t the fastest moving vessel so you don’t get to see a huge area of the canals – it is more of a going around the block type loop which is fine if you want the experience of being in a gondola but taking the water buses was a hoot, gets you everywhere and is always interesting! 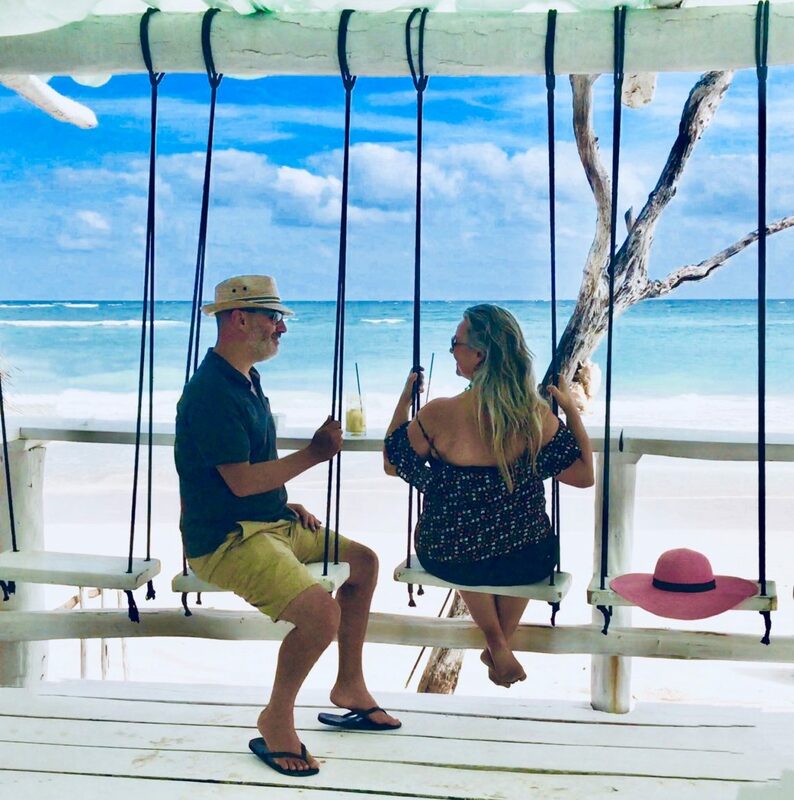 However you choose to get around and see this extraordinary place you won’t be disappointed and we would go back in a heartbeat as it’s impossible to tire of its beauty and you will forever find something new that you didn’t spot, find, come across the time before! 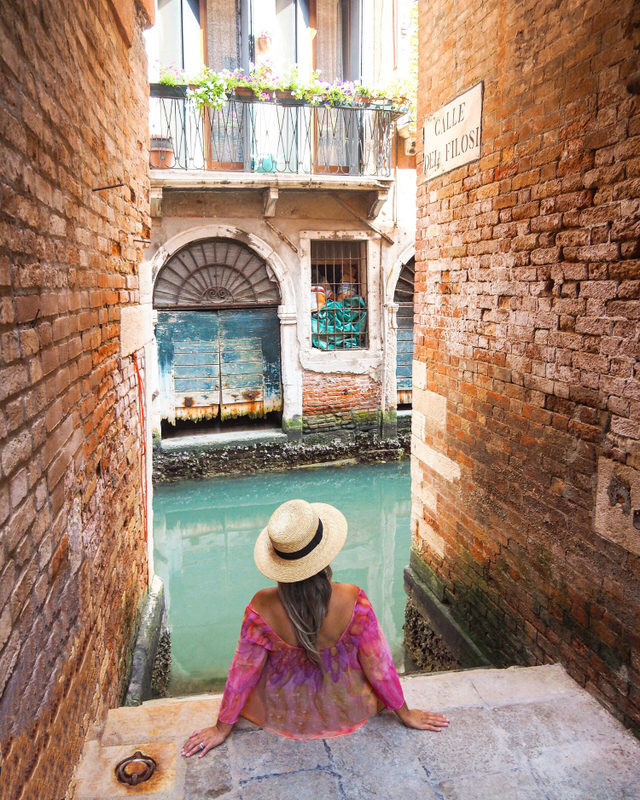 Venice is a dream! So pleased we went and well worth the effort! 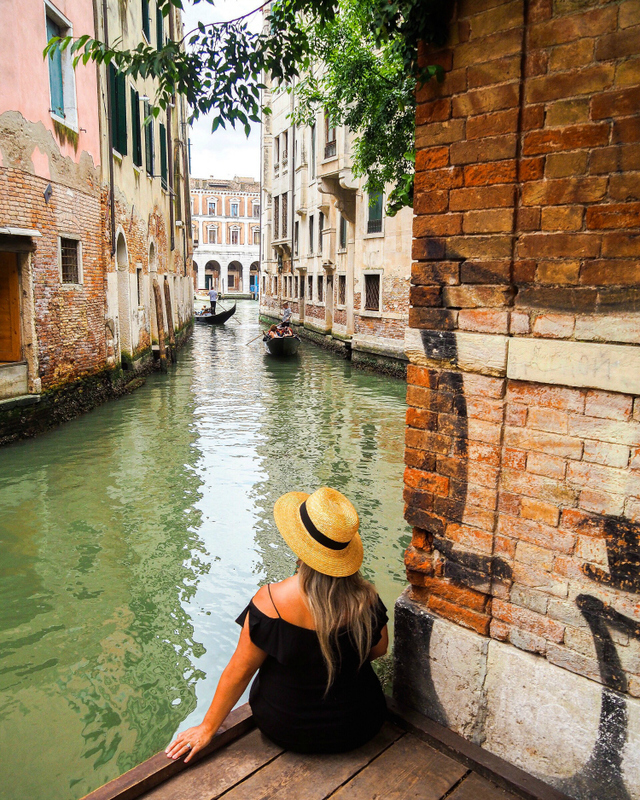 Pick up the water bus from the number 12 stop, just off of St Mark’s square … tickets from any of the news stand kiosks or at the actually stop which has a ticket office near by! ROME – on a Vespa!